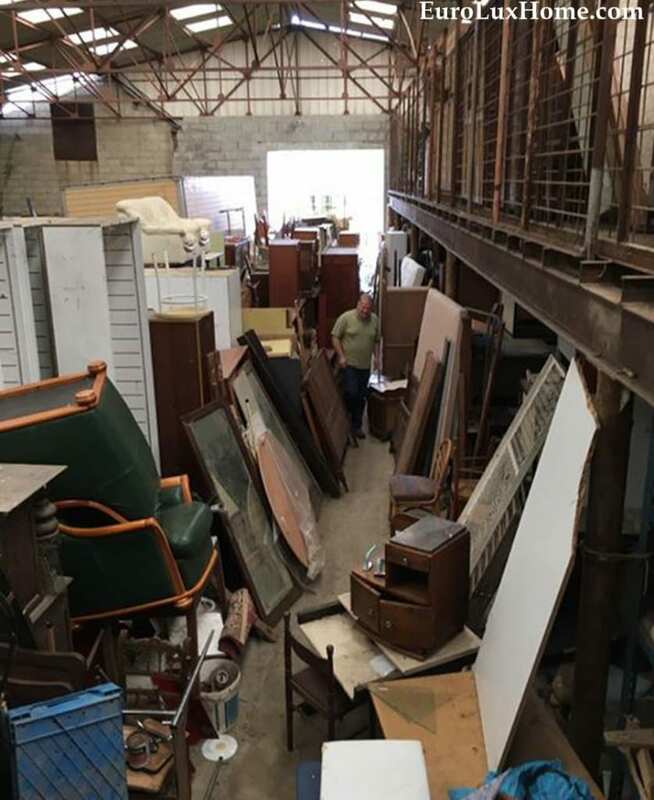 Greg and I have been in Paris and Northern France on an antiques buying trip before we head off to Belgium and England to find even more antique treasures. We already posted about the first days of our antiques buying trip in France, so here’s the next adventure in our European Pickers tour 2017! This is one of the antiques shops that we visited. 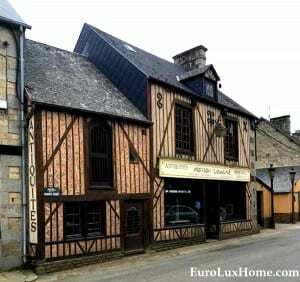 Greg loves these old half-timbered buildings in Normandy. However, our travels aren’t always so charming. In one place we arrived at what we thought was an antiques store, only to find a pile of junk and rubble. It looked more like a place where old cars go to die! And the less “glamorous” side of antique hunting in Europe is sitting in a grocery store parking lot trying to confirm where to head next! Our cell phones make life easier, unlike our earlier days of antique hunting in France where we had to rely on paper maps and public phones. Travelers’ tip: We have a Travel Pass with Verizon and can use our phones just like in the US for $10 per day. It’s totally worth it! This was one of our more successful destinations. Antique jackpot! 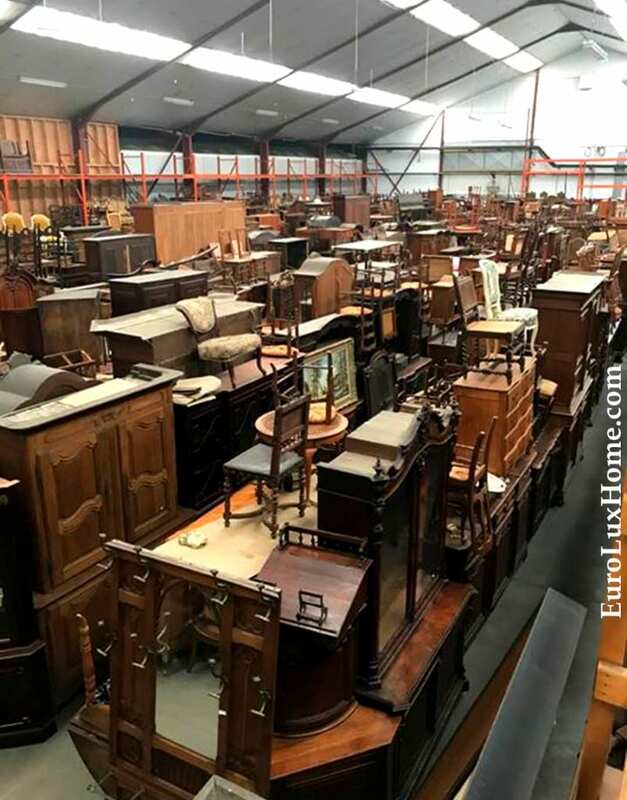 If you spot something in this photo and you want to buy it, there’s no point telling us to pick out the second chair from the left in the third row from the back! We’ve been and gone already! So this is where the antiques hide! Sometimes you have to dig around a bit. And we realized at another destination that sometimes you have to climb up to the highest vantage point to find the good stuff! You can spot Greg down there somewhere. 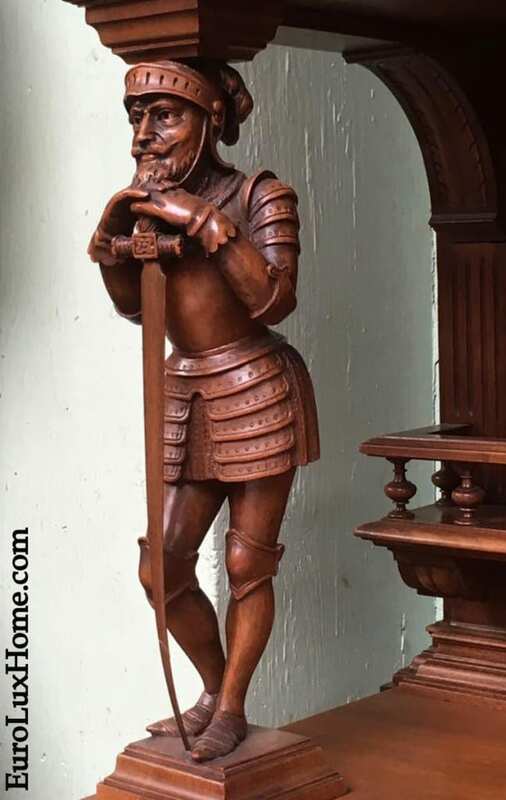 As a sample of some of the good stuff we found, this is a fantastic carving on an antique buffet. Look at the detail… it’s really wonderful. We look forward to welcoming this fine gentleman to the USA soon, once we have shipped him home. He has no idea of the voyage ahead of him! 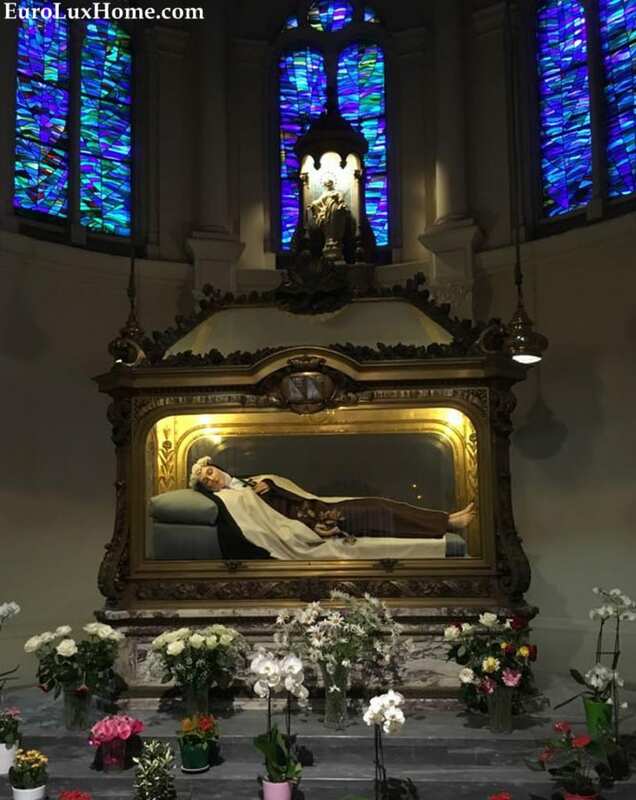 Our last stop in France was the second most visited pilgrimage site after Lourdes, the birthplace of Saint Therese of Lisieux. Known as the “Little Flower,” she suggested doing many small good deeds as a way to express piety, for which she was canonized in 1925. 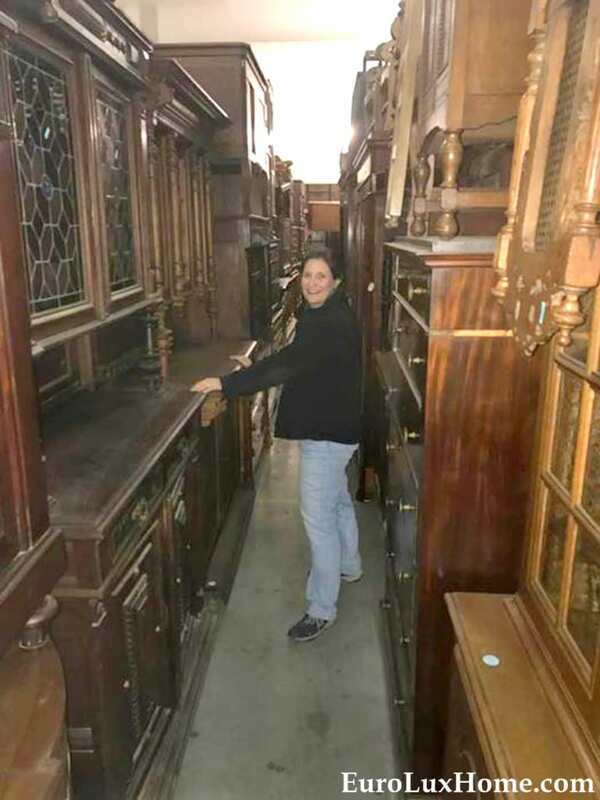 We have sold antique statues of Saint Therese a hundred times over the years, so we knew that when we had the chance to see the real deal, we needed to go! 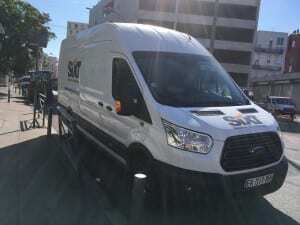 We picked up this van in France so we could transport our purchases as we travel around France. Next we head in the van to Belgium, which Greg calls his second home. In my next blog post I’ll show you our travels in Belgium and the amazing treasure trove of chandeliers we found. The next puzzle will be… can Greg fit them all in the back of the van along with all the chairs and other furniture? This entry was posted in Antiques Buying Trip and tagged Antiques Buying Trip, Antiques Shopping, Antiques Shopping in Europe, France, French Antiques, French Antiques Market on July 16, 2017 by admin.